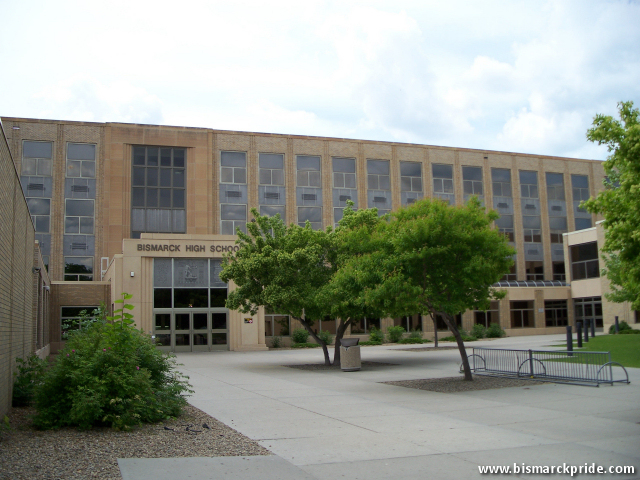 Bismarck High School has been serving Bismarck for over one hundred years. Its current facility was completed in 1935 at an initial cost of $404,000. Bismarck High was the city’s only public high school until the completion of Century High School in 1975. Its school colors are maroon and white, and its Demon mascot has been used since 1922. Bismarck’s High School, as it was originally called, was first housed inside the North Ward School, which was built in 1884. The first graduating class, in 1887, consisted of only two students. The high school was reorganized from a two-year program to a four-year program in 1897, commissioned by William Moore. The first designated high school building was built in 1912, and continued to serve as the high school until the completion of its current facility in 1935. The school board had considered three different sites before choosing to build the new high school adjacent to the 1912 structure, which continued to serve as the junior high until 1962. Voters approved a $1,850,000 bond measure to fund a new junior high (Simle), as well as an addition to Bismarck High School and demolishing the adjoining junior high (built in 1912 as the high school). Completed in 1963, it is the schools single-largest addition. In addition to a new classroom wing to its south, the project adds an additional physical education classroom, music room, and an expanded gymnasium to the northeast. Another minor addition was completed in 1986, at which time it also saw major renovation. Another renovation came in 1998.